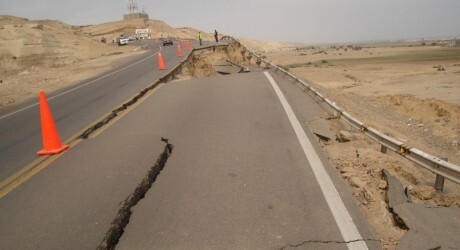 The Arabic word “zilzal” means “earthquake.” The above verses are quoted from the sura “The Earthquake.” These verses are believed to refer justifiably to the earthquake expected to occur in the end of the world; however, we should take due notice of its wider sense, depicting earthquakes in general. The fourth verse announces that men will be informed on that day. A terrible disaster like an earthquake associates in one’s mind destruction in the first place causing material damage and bodily injury, leading to a general terror and panic. This announcement must have astounded the public. To establish a link between earthquakes and knowledge of certain facts seemed inconceivable to people up until the last century. Today we have a great many data in our possession regarding the ground beneath our feet, thanks to earthquakes. The shortest radius we could draw from where we might be to the center of the earth is longer than 6000 km, a distance we can never cover. Yes, an earthquake provides information about that portion of the earth inaccessible to us. The second verse of the sura “The Earthquake” is interesting in that it refers to the burdens of the earth. Years have gone by and men have failed to understand what those burdens might be. The widely accepted interpretation was that the sura referred to the earthquake that was going to take place at the end of the world when the dead would be resurrected and treasures hidden underground would rise to the surface. The liquified metals beneath the ground are denser and heavier when compared to surface and with an earthquake these metals would rise to the surface, as if the earth is throwing out its burdens. This information is beyond the possible knowledge of the Prophet’s era. Let us not forget that people believed at the time that the earth rested on the horns of an ox or on a fish whose tail, when it moved, triggered earthquakes (the commentary of Ibn Kethir is an example). The fact that the Quran made no reference to such false beliefs is another indication of its miraculous character. 9- …Say: “Are those who know equal to those who do not know?